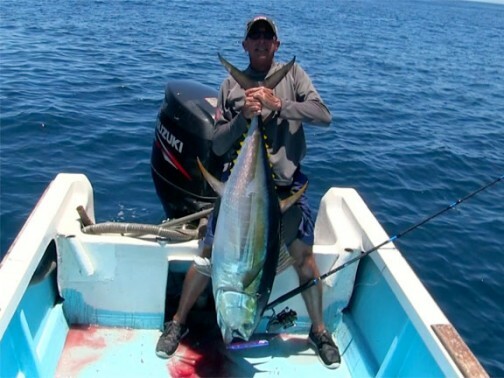 Capt Andy LoCascio lands a 57″ (approx. 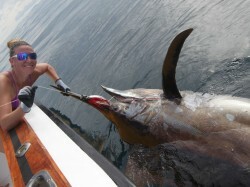 120lb) yellowfin tuna on a popping plug while fishing with the Sportfish Galapagos crew in Galapagos, Ecuador. This was one of dozens of fish that were caught on poppers. 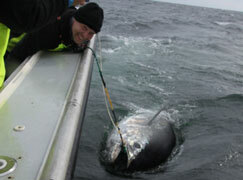 Several of the fish were well over 100lbs. The tackle used in this video including a Race Point 200 rod with a Penn Torque TRQs7 reel loaded with 50# Spiderwire Ultracast tipped with an 80lb Yo-Zuri HD Carbon leader, and a Yo-Zuri Surface Cruiser. 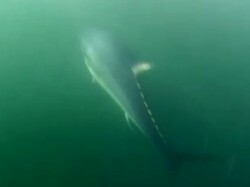 Check out the Yellowfin Tuna Plugging Guide for instruction (includes video) and the Tuna Plugging tackle recommendations.